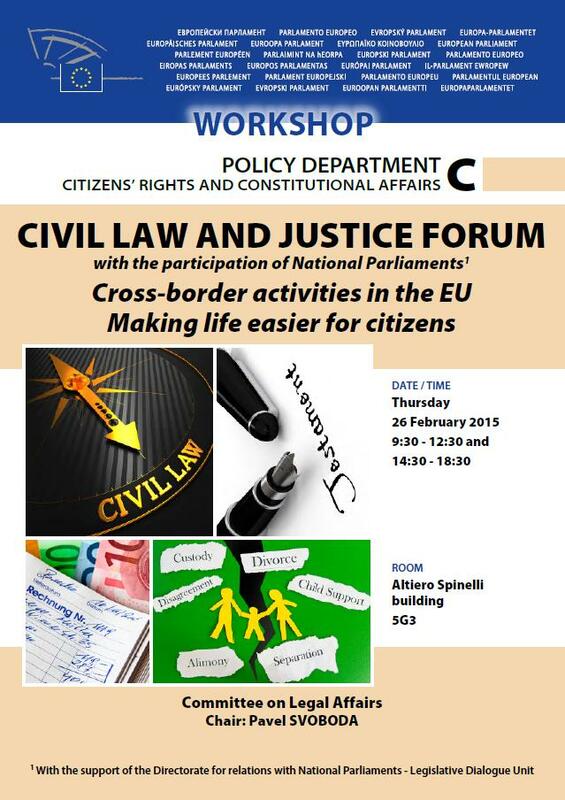 "Cross-border activities in the EU - Making life easier for citizens"
As in 2011 and 2013, the Committee on Legal Affairs held a workshop on civil law with the participation of national parliaments, on 26 February 2015. The focus for this edition was on private international law. Private international law aims to deal with the cross-border aspects of all questions related to relationships between private persons, such as family law, property law and the law of contract. Legislation in this complex field covers areas as varied as family law and sales law, but also procedural law which was until recently an exclusive prerogative of the Member States. The workshop brought Members of the European Parliament and members of the 28 national parliaments together with around a dozen experts, practitioners and academics. The three sessions of the workshop covered 'less paperwork for mobile citizens', 'cross border families and families crossing borders', and 'business and consumer concerns'. The workshop was organised by DG IPOL's Policy Department C and the National Parliaments Directorate.